Next, I'm going to read a list of problems facing the country. For each one, please tell me if you personally worry about this problem a great deal, a fair amount, only a little or not at all? How much do you personally worry about the availability and affordability of healthcare? Next, we'd like to know how you feel about the state of the nation in each of the following areas. For each one, please say whether you are -- very satisfied, somewhat satisfied, somewhat dissatisfied or very dissatisfied. If you don't have enough information about a particular subject to rate it, just say so. How about the availability of affordable healthcare? Next, we'd like to know how you feel about the state of the nation in each of the following areas. For each one, please say whether you are -- very satisfied, somewhat satisfied, somewhat dissatisfied or very dissatisfied. If you don't have enough information about a particular subject to rate it, just say so. How about the quality of medical care in the nation? * Less than 0.5%; Totals add to less than 100% becuase "Other" responses and "No opinion" not shown. Now thinking about healthcare in the country as a whole, overall, how would you rate -- [ROTATED: the quality of healthcare in this country/healthcare coverage in this country] -- as excellent, good, only fair or poor? Are you generally satisfied or dissatisfied with the total cost of healthcare in this country? ^ NOTE: Asked in rotation with other items. Which of these statements do you think best describes the U.S. healthcare system today -- [ROTATED: it is in a state of crisis, it has major problems, it has minor problems (or) it does not have any problems]? Do you think it is the responsibility of the federal government to make sure all Americans have healthcare coverage, or is that not the responsibility of the federal government? Which of the following approaches for providing healthcare in the United States would you prefer -- [ROTATED: a government-run healthcare system (or) a system based mostly on private health insurance]? Who pays the cost of premiums on your health insurance? Do you or someone in your household pay the total cost, does an employer pay the total cost, or is the cost shared between the employer and you or someone in your household? * Less than 0.5%; (vol.) = volunteered response. Over the past year, has the amount YOU paid for your family's health insurance -- [ROTATED: gone up a lot, gone up a little, not changed, gone down a little (or) gone down a lot]? * Less than 0.5%; (vol. )= volunteered response. Within the last twelve months, have you or a member of your family put off any sort of medical treatment because of the cost you would have to pay? [IF YES] When you put off this medical treatment, was it for a condition or illness that was -- very serious, somewhat serious, not very serious or not at all serious? Overall, how would you rate -- [ROTATED: the quality of healthcare you receive/your healthcare coverage] -- as excellent, good, only fair or poor? * Less than 0.5%; (vol. )=volunteered response. Are you generally satisfied or dissatisfied with the total cost you pay for your healthcare? Do you generally approve or disapprove of the 2010 Affordable Care Act, signed into law by President Obama that restructured the U.S. healthcare system? On another subject, for each of the following business sectors in the United States, please say whether your overall view of it is very positive, somewhat positive, neutral, somewhat negative or very negative. How about the healthcare industry? On another subject, for each of the following business sectors in the United States, please say whether your overall view of it is very positive, somewhat positive, neutral, somewhat negative or very negative. How about the pharmaceutical industry? Since the Affordable Care Act went into effect a few years ago, do you think it has been -- [ROTATED: very successful, somewhat successful, somewhat unsuccessful (or) very unsuccessful] in -- Expanding Americans' access to healthcare coverage? Since the Affordable Care Act went into effect a few years ago, do you think it has been -- [ROTATED: very successful, somewhat successful, somewhat unsuccessful (or) very unsuccessful] in -- Reducing the cost of healthcare for Americans? As you may know, some senators have proposed a "Medicare-for-all," single-payer health insurance program that would be administered by the federal government and financed through taxes. Please tell me if you favor or oppose this proposal, or if you don't know enough to say? If you had to choose, would you rather -- [ROTATED: keep the Affordable Care Act in place largely as it is, keep the Affordable Care Act in place but make significant changes to it, (or) repeal the Affordable Care Act and replace it with a new healthcare law]? As you may know, a number of the provisions of the healthcare law have already gone into effect. So far, has the new law -- [ROTATED: helped you and your family, not had an effect, (or has it) hurt you and your family]? ^ WORDING: "As you may know, a few of the provisions of the healthcare law...."
So far, has the law -- [ROTATED: helped the healthcare situation in the U.S., not had an effect (or has it) hurt the healthcare situation in the U.S.]? In the long run, how do you think the healthcare law will affect your family's healthcare situation? Will it -- [ROTATED: make things better, not make much difference (or will it) make things worse]? ^Asked on Gallup Daily tracking poll; #WORDING: "Now suppose all of the provisions of the healthcare law go into effect in the next few years...."
In the long run, how do you think the healthcare law will affect the healthcare situation in the U.S.? Will it -- [ROTATED: make things better, not make much difference (or will it) make things worse]? Within the last twelve months, have you or a member of your family put off any sort of medical treatment because of the cost you would have to pay? [Asked of those who put off medical treatment due to cost] And when you put off medical treatment, was it for you, another family member or both? (Asked of uninsured adults) According to the Affordable Care Act, most Americans will be required to have health insurance or pay a fine. Were you aware of this before now, or not? * Less than 0.5%; ^ WORDING: WORDING: As you may know, under the terms of the Affordable Care Act, starting January 1st most Americans will be required..."
(Asked of uninsured Americans) As I mentioned, Americans without health insurance either have to get health insurance or pay a fine. Given what you know, as of right now, would you say you are -- [ROTATED: more likely to get health insurance (or) more likely to pay the fine]? ^ WORDING: "Beginning January 1, 2014, Americans without health insurance will either have to get health insurance or pay a fine...."
(Asked of uninsured adults who plan to get insurance) Do you plan to get health insurance for 2014 specifically through a state or federal health insurance exchange, or not? (vol.) = Volunteered response; ^ WORDING: [Do you plan to get / (if signed up for 2014 in 2013): Have you gotten] health insurance....?" Do you think it would be justified or unjustified to set higher health insurance rates for people who smoke? Do you think it would be justified or unjustified to set higher health insurance rates for people who are significantly overweight? In general, would you say that the 2010 healthcare law recently upheld by the Supreme Court will make things better or worse for each of the following? How about ... [RANDOM ORDER]? As you may know, two years ago, Congress passed a law that restructures the nation's healthcare system. All in all, do you think it is a good thing or a bad thing that Congress passed this law? ^ WORDING: "...a year ago...' # WORDING: "...yesterday..."
As you may know, the Supreme Court will hear arguments next month concerning a requirement in the healthcare law that every American must buy health insurance or pay a fine. Regardless of whether you favor or oppose the law, do you think this requirement is constitutional or unconstitutional? When your doctor gives you important medical advice, which comes closer to your view -- [ROTATED: you usually feel confident in the accuracy of your doctor's advice, (or) you usually feel it is necessary to check for second opinions or do your own research on the subject]? Next, we'd like to read a list of several aspects of the U.S. healthcare system. For each, please tell me if you think the medical care or medical services they provide are generally excellent, good, only fair or poor? How about -- [RANDOM ORDER]? Would you advise your member of Congress to vote for or against a healthcare bill this year, or do you not have an opinion? (Asked of those with no opinion on healthcare bill) As of today, would you say you lean more toward advising your member of Congress to vote for a healthcare bill, or lean more toward advising your member of Congress to vote against a healthcare bill? If Congress is going to reform the healthcare system, should Congress deal with healthcare reform on a gradual basis over several years, or should Congress try to pass a comprehensive healthcare reform plan this year? If you had to choose, which goal would you say is more important in terms of healthcare -- [ROTATED: expanding healthcare coverage to include nearly all Americans (or) controlling rising healthcare costs in the U.S. today]? As you may know, President Obama is proposing a healthcare plan that is designed to expand coverage to nearly all Americans without raising taxes on the middle class or lowering the quality of healthcare. If Obama's plan is passed, do you think it would or would not be able to accomplish all of these goals? How confident are you that most of the cost of President Obama's healthcare plan can be paid for through cost savings in Medicare and other parts of the existing healthcare system -- very confident, somewhat confident, not too confident or not confident at all? For each of the following health conditions, please say whether you think it is a very serious problem around the world, a somewhat serious problem or not a serious problem? How about -- [RANDOM ORDER]? 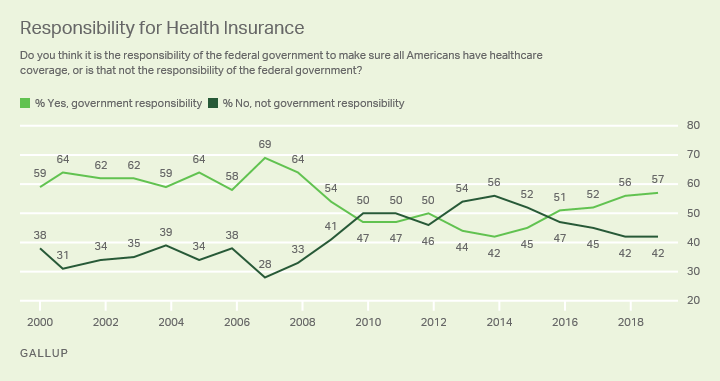 Fifty-five percent of Americans now say they worry about healthcare a great deal, topping Gallup's list of potential worries for the fifth year in a row and for the 11th year since 2001. Majorities of Americans are satisfied with just five of 22 policy areas in the U.S. -- military strength, security from terrorism, the position of women, the economy, and acceptance of gays and lesbians. Seventy percent of Americans describe the current U.S. healthcare system as being "in a state of crisis" or having "major problems." Negative ratings of the system are even higher among Democrats (84%).